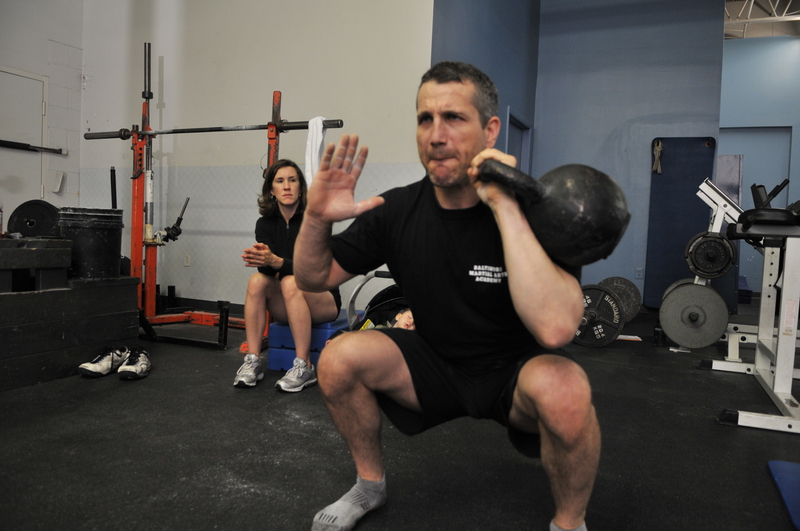 Baltimore Kettlebells offers comprehensive instruction in kettlebell training. All programs are lead my RKC II certified instructor & school owner, Danyelle Berger. Danyelle’s teaching methodology emphasizes proper technique & a motivational style that has her students pumped and excited to workout and keep coming back to class. Classes are held at the Baltimore Martial Arts Academy in Catonsville, Maryland. The 6000 square foot facility in conveniently located and has many accommodations including a lounge with television, locker rooms, FREE Child Care and more! It is very important to have proper technique when learning to use kettlebells. Improper technique leads to injury, muscular imbalances & problems that may require longer to fix than they took to develop. Kettlebells can not be learned from a book or video. A student of kettlebells must seek out a professional to teach them proper from & give them accurate and proper correction. Don’t be fooled by anyone claiming to teach kettlebells that are not RKC certified. The prized RKC certificate represents a “Black Belt” in kettlebell instruction that requires extensive pre-training to attain. A grueling, “experience of a lifetime”, the RKC program is the ONLY current program which insists on stringent testing of multiple skills and strengths. Currently only an average of 70% of RKC candidates succeed in passing the requirements by which they can proudly hold themselves forth as “RKC-certified”. Those new to kettlebells are encouraged to attend a beginner training class at the Baltimore Martial Arts Academy to become familiar with basic techniques prior to starting classes. Please contact us at 410-465-7799 to schedule your first class. What Can Too Much Working Out Do to Your Body?